The Pentagon has ordered an expansion of covert missions by US special operation forces in the Middle East and Central Asia. 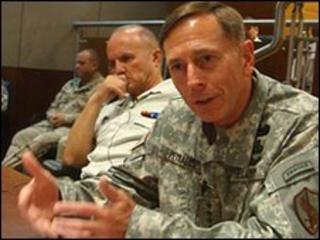 The New York Times newspaper said it has seen the copy of a seven-page order by the head of US Central Command, General David Petraeus. The directive - signed in September - focuses on gathering of intelligence and building ties with local forces. The US Defence Department has not made any official comment on the report. According to the New York Times, US troops will carry out special missions in both friendly and hostile nations and Gen Petraeus's order is aimed at making such efforts more systematic and long term. The paper says the order calls for small teams of American troops - presumably special operations forces - to fill intelligence gaps. Its goals are to build networks that could penetrate, disrupt, defeat, or destroy militant groups like al-Qaeda, and also prepare the environment for future attacks by American or local military forces. The paper says the document appears to authorise specific operations in Iran. The Pentagon has increased its covert operations in recent years. It has also acknowledged an increase in co-operation with countries like Yemen. The move may be a response to the concern expressed by many that the threat from militants has migrated elsewhere while the United States has been concentrating on Iraq and Afghanistan.